A formal process can help volunteers and mentees have a positive attitude about closure. Supervisors should walk the volunteer and the mentee through the final stages of the relationship. Providing support and guidance is a crucial Supervisor role and if successful, can help the match end on a positive note. 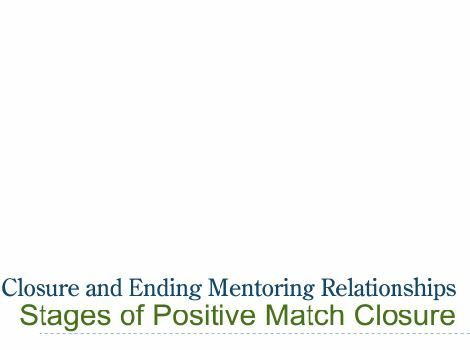 This chapter will cover information regarding strategies to ensure a positive match closure. The closure process begins with notification. Both the volunteer and the mentee need to know that the relationship is ending. Tailor the notification of the ending to each party, explaining in a way that each will understand. If possible, meet with the mentor to help prepare them for ending with the mentee. Ensure that there is enough time for those involved to have a chance to absorb the information. If possible, give the mentor and mentee eight weeks’ notice before the last time they see each other. If the mentor is unavailable or not capable of ending, the mentoring supervisor is responsible for ending with the mentee. 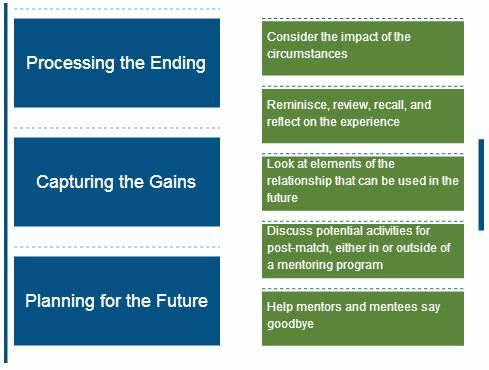 When running a site-based mentoring program, make sure to mention the end of the program at least a month before the program ends to give the group enough time to process that the end is near. In addition, incorporate activities that will prepare both the volunteer and youth for the match closure and to help facilitate conversation around it. Allow time for the volunteer and mentee to process the ending. The ending will not likely be easy for either the volunteer or mentee. Many mentoring relationships can be intense and emotional. To help them process the ending, encourage them to discuss their feelings about it with you and with each other. Consider the impact of the specific circumstances around the ending on the feelings of all involved. Be aware of and acknowledge the feelings of previous endings that are generated, but primarily focus on this ending, the mentoring experience, and plans for the future. 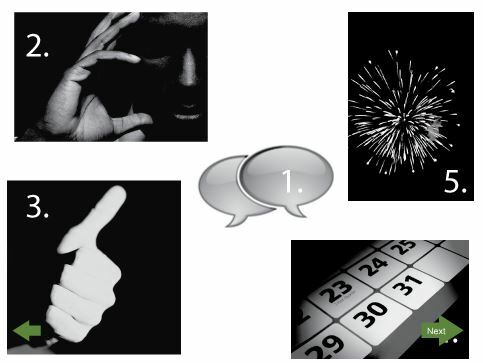 Reminisce, review, recall, and reflect on what has happened during the mentoring experience. Help the volunteer and mentee capture the gains of the relationship. Focus on the positive elements and experience that were a part of the mentoring experience. Identify how the mentor and mentee can pull together what has happened and what it has meant to them. Look at what elements of the experience can be used in the future. Facilitate planning for the future. Turn the attention of the volunteer and mentee towards the future. Help them plan for what will happen after the match ends. Consider what will happen in terms of a re-match for either the mentor or the mentee. Encourage the mentor and mentee to consider what they will bring from this match into future relationships and activities. Discuss and suggest future activities, including those in mentoring and outside mentoring programs. Consider and facilitate an appropriate ending ritual, which will allow the volunteer and the mentor to say goodbye to each other and to the relationship. Incorporate celebration of the mentoring experience into the event. Encourage them to say goodbye, this will help mentors and mentees move forward through this phase without making unrealistic promises.